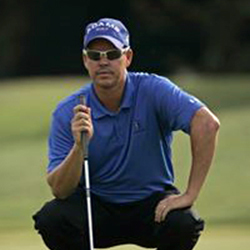 This is Brad Ott, Director of Instruction here at TPC Craig Ranch, PGA of America member. Today, I want to talk to you a little bit about some of the things that I like to teach my students when it comes to bunker play. One of the things I notice is lack of speed when I see some of my more innovative players playing. the club, you want it to move fast through, but you want the handle to stay in the pocket. If you can get the hand on the pocket, what you'll notice is that club will move pretty quick, and will literally just stick the handle into the pocket of your pants. It'd be your left pants if you're a right handed golfer, right pocket if you're a left handed golfer. So, it's going to look something like this. Once you get done, the handle should be pretty close to your pocket, and you'll literally just put the handle right in the pocket. So that's a little drill that may help you get some speed in your bunker play and hopefully get you out of the sand more often and get you closer to the hole. 368 Golf Training Videos about the club type "Wedge"
357 Golf Training Videos about "Short Game"
230 Golf Training Videos about "Drills"
110 Golf Training Videos about "Bunkers"